Happy Friday, friends! Fridays are even sweeter than usual in the summertime, right? Hope you have some fun weekend plans that include plenty of relaxation and a cold beer (or three). 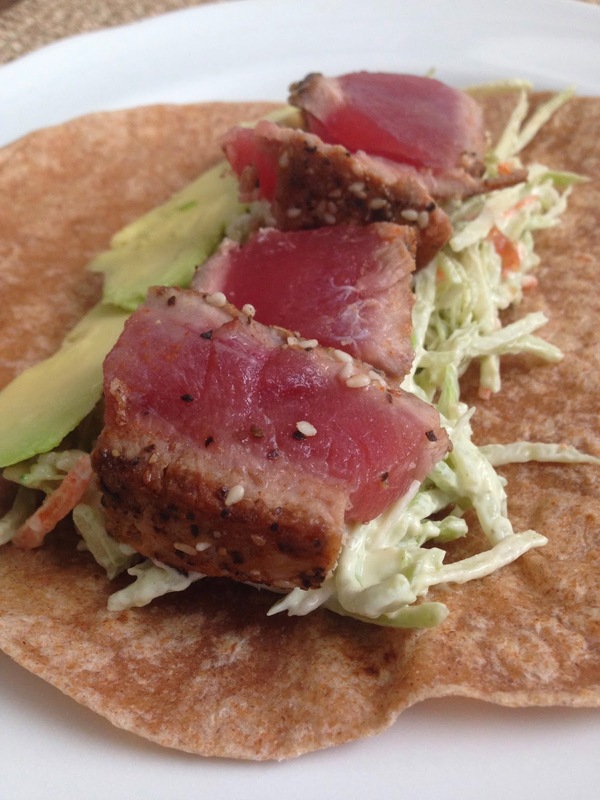 You might want to add something to your agenda: make these seared ahi tuna wraps with wasabi mayo and avocado. YUM. 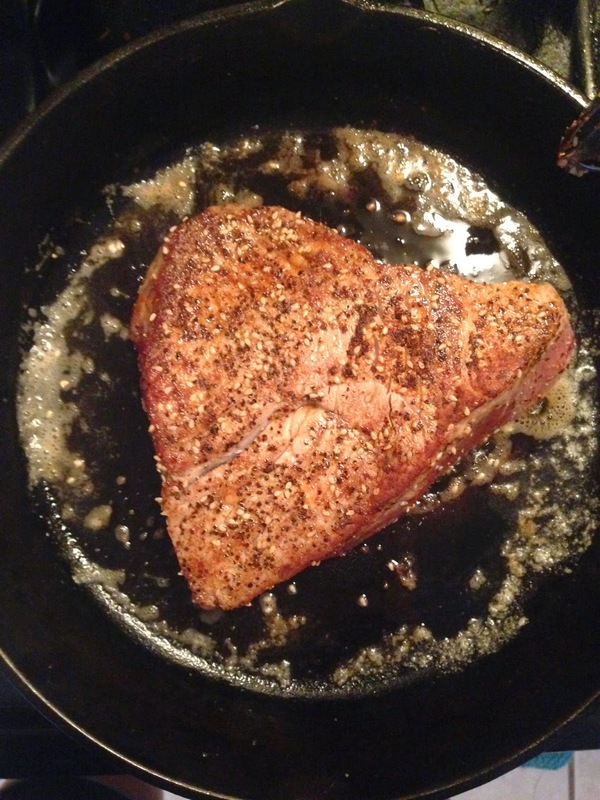 Fresh-caught ahi tuna seasoned then seared over high heat. Layered into a whole wheat wrap with clear-your-sinuses-spicy wasabi mayo and creamy avocado. Ready in 10 minutes. For real. 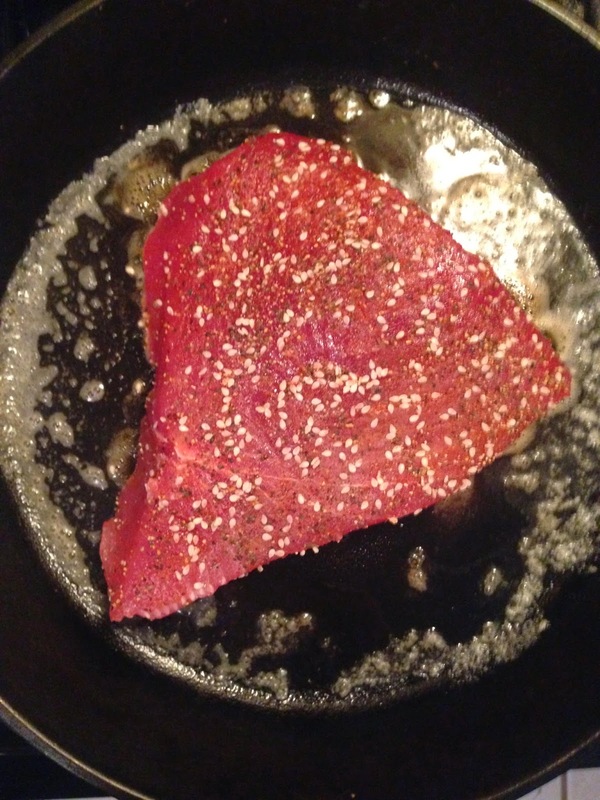 Season one big, fresh-caught, sushi-grade ahi tuna steak with sesame seeds, garlic, ginger, cayenne, and salt and pepper. Melt a tablespoon of butter and a tablespoon of EVOO over medium high heat. While that gets hot, throw together your wasabi mayo slaw. Simply mix 1 cup of prepared broccoli slaw with 2 tbsp prepared wasabi mayo (or make your own -- see below) and 2 tbsp rice wine vinegar. Add your tuna to the hot pan. Sear on the first side for about a minute and a half. No touching or moving while it's cooking! Anddd flip. Cook for another 1.5 minutes. Place the tuna on a cutting board and let sit for about 5 minutes. Then slice into quarter inch-thick slices. 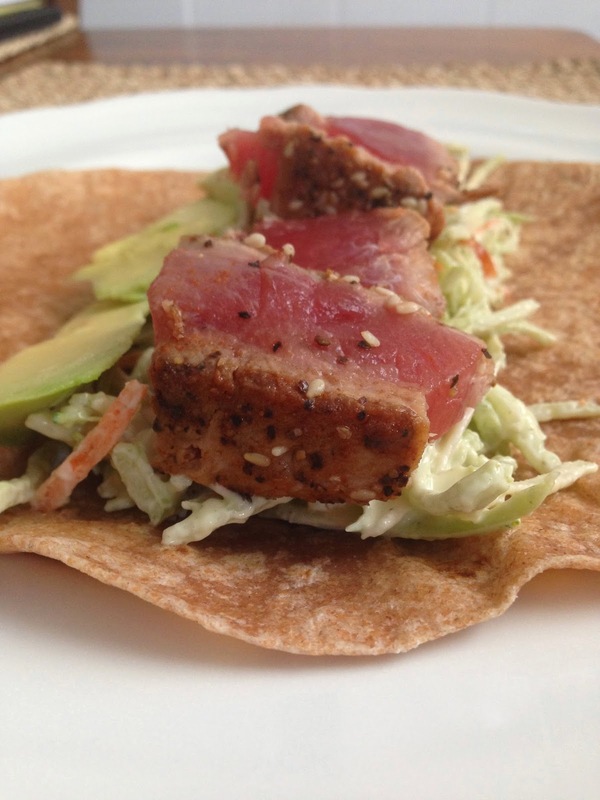 Layer your tortillas with wasabi slaw, avocado, then tuna. Wrap and enjoy! 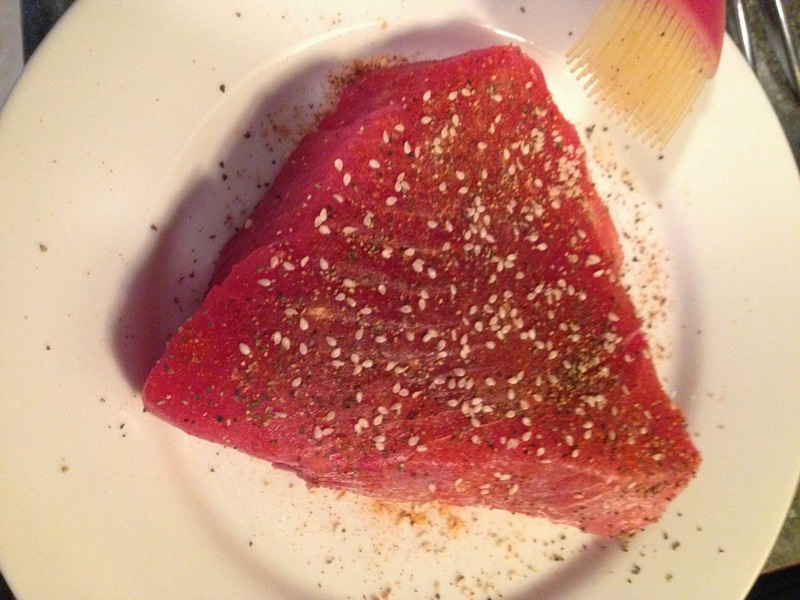 -Season both sides of tuna liberally with sesame seeds, cayenne, garlic powder, ginger, salt, and pepper. -For wasabi mayo slaw, combine the slaw, wasabi mayo, and vinegar. Cover and refrigerate until ready to use. -Melt the butter and olive oil in a heavy-bottmed (cast iron works best) skillet over medium high heat. Once hot, add the tuna steak. Let sit without touching it for about 1.5 minutes. Then flip and cook for another 1.5 minutes. Remove and place on a cutting board. Let sit for about 5 minutes. -Slice the tuna into 1/4 inch-thick slices. -To assemble the wraps, put half the slaw onto each wrap. Top with several avocado slices. Top with tuna slices. Wrap and enjoy! 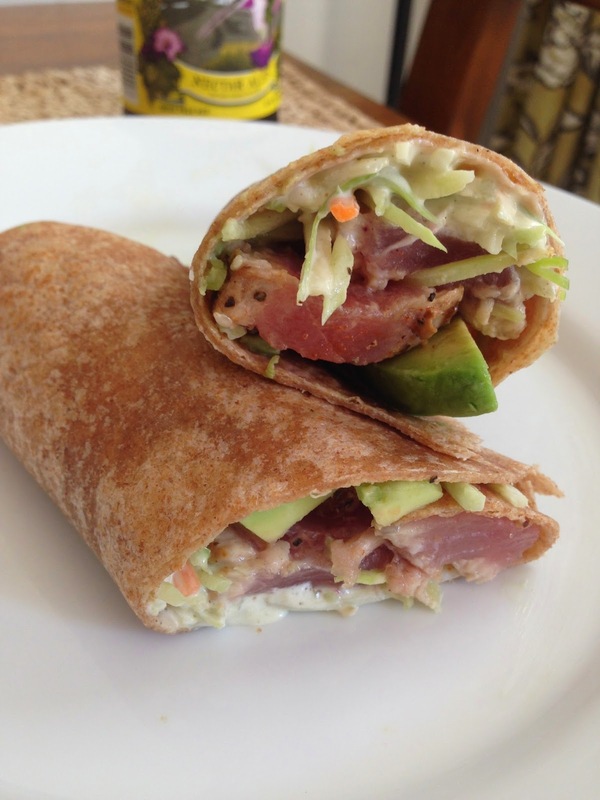 i love tuna steak but never thought to put it in a WRAP. genius. can't wait to make! Brilliant recipe. I have got to try this.